The Final Four Of The Madden NFL 25 Cover Vote, Has Begun! Cast Your Vote Now! 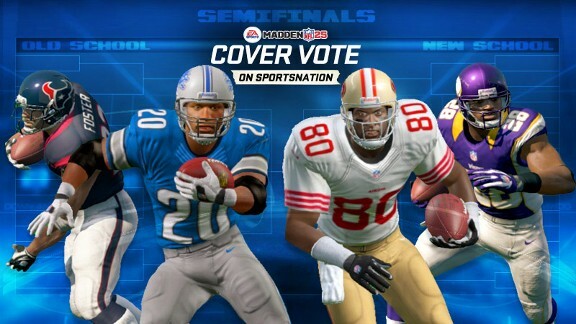 The cover campaign featuring both legends and current stars for Madden NFL 25 has reached the finals in the two brackets. The “Old School” and “New School” participants have been shaved down to two each with the eventual winners from each side facing off for the cover honors. Barry Sanders goes up against Jerry Rice while Arian Foster will take on Adrian Peterson. Foster’s run is the only thing that could be considered a surprise especially having quit social media prior to the tournament. He has gone on to beat Julio Jones, Colin Kaepernick, and now Russell Wilson. There are currently one, two, three, and four seeds remaining. Peterson is likely to move on (he absolutely CRUSHED Robert Griffin III) with the Rice-Sanders pairing (both collected about equal percentage with comparable opponents) much more difficult to call. Voting is completed through the ESPN SportsNation Page. The fifth round runs until April 17th when it will move forward to the overall finals. The cover campaign featuring both legends and current stars for Madden NFL 25 has reached the semifinals in the two brackets. The “Old School” and “New School” participants are now in the Final Four stage with the eventual winners from each side facing off for the cover honors. Another round has passed without any big surprises and the result is some epic pairings to vote on. Colin Kaepernick is gone in what some might consider an upset due to his #1 seeding but he never had near the support of other high seeds – it was evident after the first round that he wouldn’t be a contender. The match-ups are Joe Montana vs Barry Sanders, Jerry Rice vs Deion Sanders, Arian Foster vs Russell Wilson, and Robert Griffin III vs Adrian Peterson. Voting is completed through the ESPN SportsNation Page. The fourth round runs until April 10th when it will move forward to the finals for each bracket.